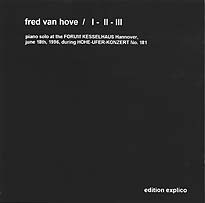 Recorded on 18 June 1996 at Forum Kesselhaus, Hannover during Hohe-Ufer-Konzert No. 181. Front cover collage, with jewel box enhanced by the tops of two white piano keys, by Günter Christmann. This is a limited edition of 50 CDRs, each signed and numbered by Fred Van Hove.